On 27th October, the 20th Field Company was employed in the construction of a secondary line of defense works about 1/2 mile to the south-east of the village La Couture, about 5 PM on that date, after finishing work for the day, they were about to be marched off to billets at Bout Deville (where the transport of the Company had already gone). There, the Company received orders to proceed at once to Richebourg St Vaast where they arrived about 5.30 PM and were told to wait there till further orders. The account in the war diary below begins later on the same day. Approximately 190 men from the 20th Field Company took part in the attack with 23 being killed and 54 wounded. About 7 PM a reconnoitering patrol of twelve men under Lieutenant Rait-Kerr with Sergeant Spinks [?] was sent out along the road leading south from Richebourg with orders to reconnoiter along the Rue du Bois. They returned about 9 PM and reported that they had seen no signs of the enemy. By this time, Captain Paris had returned from the conference. He said that the general situation was that the enemy had forced our line east of Neuve Chapelle, had captured the village, and had thus established himself in a re-entrant in outline from which is was most important that he should be expelled at once; that the situation was considered very critical. He had been ordered to proceed with the company to Pont Logy where he would meet a staff officer who would guide the company to the left (east) of the 9th Bhopal Infantry in prolongation of whose line they were to dig themselves in. The 21st Company who had also been called up were to dig themselves in on our left. Extra ammunition was issued, making a total of 120 rounds per man with four boxes in reserve and the company marched out of Richebourg at about 9.30 PM. At Pont Logy no staff officer could be found, and the 9th Bhopal, who were occupying a garden to the south east of that place, said that they feared that they were not in the right position. Much confusion arose which was increased by the 9th Bhopal opening a very heavy fire in our direction and evidently mistaking our approach for a hostile attack. It was a very dark night, Captain Paris and one section got separated from the rest of the company and could not be found, and it was not till about 11 or 11.30 PM that order was sufficiently restored to enable us to start digging. Even then the site had to be chosen at random. By about 4.30 AM the company had dug itself in, but practically throughout this time they were under continued fire from some men of the 9th Bhopal and from the enemy’s snipers and before dawn had suffered two casualties. At about 5 AM Captain Paris was called back to receive orders from G.O.C. Brigade at Pont Logy. Apparently, no written orders were issues; it was merely arranged that if possible an artillery bombardment of the village would take place early in the morning and that after that bombardment ceased, a general advance by the whole line against the village would follow. Meanwhile, Lieutenant Nosworthy had gone out to try and establish communication with the 21st Company of which there had been no signs. He eventually found Lieutenant Almond who told him that they had lost their way and after wandering about for some time, had decided to dig themselves in where they were and wait till dawn. It was found that between the two companies there was a gap of 700 yards. This was reported to Headquarters: and at dawn half a battalion of the 47th Sikhs came up and occupied this space. At about 10.30 AM on the 28th, the artillery bombardment of the village began. This continued for about half an hour and then ceased. A few minutes later, it appeared to us that an advance on our left had begun, and shortly afterwards it was decided that, if we were to cooperate, we could not afford to wait any longer for orders. Captain Paris ordered an advance of the company by sections and informed the 9th Bhopals. The company advanced by section rushed across 300 yards of plough which separated them from the village, the outskirts of which they reached with very little loss. But they were unsupported on their right since, for some reason, the 9th Bhopal had not advanced. The consequence was that they were enfiladed by fire from a trench on their right. No 3 Section, however, were turned about, right heeled and succeeding in charging the trench with the bayonet. The whole company then went forwarded into the village up its main street. Here they suffered considerable loss from the enemy who were occupying the houses and from two or three machine guns outside the village which were raking the street. A good deal of confusion ensued, but finally the whole street was captured up to the further side of the village. Lieutenant Hayes Sadler then attempted to charge one of the machine guns with about fifty men (all the sections were by this time hopelessly mixed), but was shot and the attempt failed. 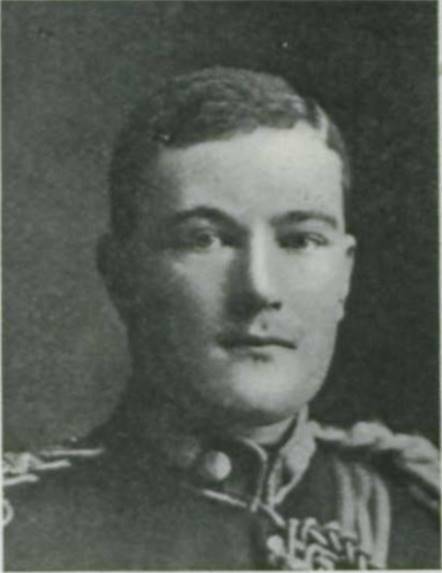 Lieutenant Edwin John Berkeley Hayes Sadler who was killed in action during the attack on Neuve Chapelle while attempting to charge a machine gun. His elder brother, Captain Ernest Reginald Sadler Hayes, 2/8th Gurkha Rifles was killed in action two days later. This photograph was published in Bond of Sacrifice. The men dashed back in a panic and carried most of the remainder of the company off their feet. It is impossible to ascertain where they went to, but apparently they got mixed up with the 47th Sikhs who had entered the village on the left, who were just at that moment being driven back by a counter attack in force by the enemy. Apparently they were driven right out of the village and suffered severely from the enemy’s machine guns in their retreat across the open country back to their lines. The above must have happened a about 12.30 PM. Lieutenant Nosworthy and Rait-Kerr then found themselves in the centre of the village with only about 20 men left. Lieutenant Rait-Kerr went back to try and bring in support. The remainder proceeded to barricaded the cross-road at the centre of the village so as to check the machine gun fire which was raking it. Having finished this, they maintained themselves in the house from which they could reply to the fire of the enemy. Two other messages for support were sent back, but produced no result. It appears that Lieutenant Rait-Kerr was shot soon after he left the village. This state of affairs continued till about 3.30. PM and there can be very little doubt that had we been reinforced at anytime up till then, the attack on the village would have been successful and we could have, by enfilade fire, silenced the enemy’s machine guns. At about 3.30 PM, Major Jameison of the 9th Bhopals and a few of his men entered the village by the rad and were holding. We made one more attempt to charge one of the machine guns but failed again, and Major Jameison said that as the attacks on both flanks appeared to have failed entirely, we had better fall back at once to our own lines. Thirteen men (including Subadar Ganpat Mahdu) retired out of the village with me (Lt. Nosworthy). Although fired on at once, we managed to get back to our trench without further loss. Here we found Lieutenant Rait-Kerr who was just recovering from the shock of his wound and who was trying to return to the village. We collected as many rifles, picks, shovels etc. as we could carry and then retired to Estaired where I reported to the Commander of Royal Engineers at 8 PM. On the following morning both Lieutenant Rait-Kerr and myself were invalided home. Lieutenant Rait-Kerr told me that Captain Paris had gone back to bring on the 9th Bhopal when we were advancing from our trench and had been shot in doing so. 20/01/15 Northern France Captain Nosworthy. The attack led to a number of gallantry awards being bestowed on Indian soldiers. 3795 Sapper Dalip Singh won the Indian Order of Merit 2nd Class for rescuing Lieutenant Rait-Kerr after he had been wounded, standing over the officer and firing at the oncoming Germans. Subadar Gunpat Mahadeo was awarded the Order of British India 2nd Class for his bravery throughout the battle. Subadar Malla Singh was awarded a Military Cross for his bravery in the battle, and skill in withdrawing his men.